The youngest sibling of a close-knit Cuban-American family, Sabrina Rosell is a political science major and the current student body president at the Modesto A. Maidique Campus. 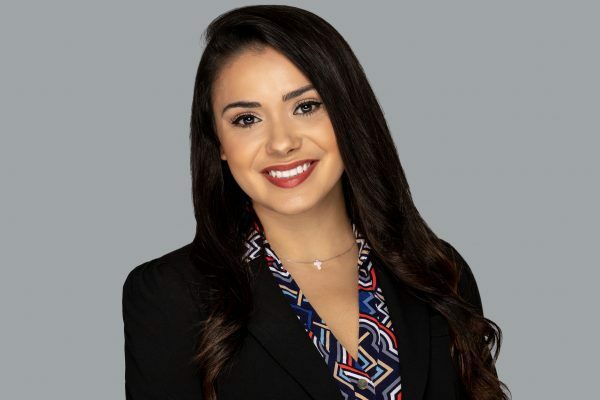 Rosell has held several internships with different elected officials, including Miami Dade County Commissioner Juan Zapata and U.S. Representative Carlos Curbelo. She has been involved with the FIU Student Government Association (SGA) since her freshman year and served in serval capacities. Rosell currently works part-time for Live Like Bella, a non-profit pediatric cancer foundation, and serves in her church’s Youth Ministry mentoring young students. A driven advocate and devoted leader, Rosell is determined to ensure FIU has a voice at the local, state and federal level during her presidency. FIU News sat down with Rosell recently to get to know the new MMC SGA president. Why did you choose to attend FIU? From the moment I started doing dual enrollment, I fell in love with FIU—everything about FIU. One of the biggest things I fell in love with was the diversity. For me, diversity is not just about ethnicity or religion. I think that FIU embodies diversity in the sense of diversity of walks of life. I loved that because it really felt like this campus had a place for everybody. And it just felt like home. As SGA president, what have you found to be the most exciting aspect of your position? Meeting students. I walked into FIU thinking I know who the students are. But in this capacity, you get to know the students more intimately. You hear about (their) incredible stories, and I’m always blown away by the things our students are doing. Our students are some of the most incredible people. For students who are unfamiliar, what role does SGA play in the lives of the student body? Sometimes students aren’t clear exactly what it means to be in SGA. They think it’s another club. SGA’s role is to make sure we always have a pulse on what the student body wants and that we are held accountable to being that voice even if it’s something that we are not passionately about. Within student government, we oversee the allocation of the entire activity and service fee which amounts to approximately $20 million. A lot of the programming that’s happening in terms of Student Affairs, Student Programming Council (SPC) and homecoming—all that funding comes from us giving those funds to those respective organizations to be able to function. What are your top priorities as president? A lot of students don’t realize that lobbying in Tallahassee and making sure there’s a student voice in Tallahassee is so important. So (I plan on) working closely with the Office of Governmental Relations on that. And also work on local FIU Day so that the county commission is also familiar with FIU students. We are going to connect students from different colleges to different departments within the county, so that they have that ability to meet them, learn about things in the county and also (decide) if they want to work there in the future. There’s so much more to football games and having that affinity to your university than just actual game attendance. Our football players perform better when there’s a crowd out there. We rank better. We get more wins. Our institution continues to grow in visibility and it’s just a multipurpose kind of thing. So, you’re hitting the ball in everything. Students are having fun at the games. Students are enjoying the experience. Students love their university. They love their university when they graduate. They want to come back to more football games. There’s more game attendance. FIU is bigger. So, it’s just this big piece that needs to be focused on— not just tailgating. It’s so much bigger than that. What advice would you offer to every FIU student? Get involved. It makes a world of a difference in every aspect. When you’re involved in something, you’re more invested in it. You’re more invested in your education. You’re more invested in your time here at FIU, and it adds value to what you are doing while you are studying. It’s easy to just register for classes and leave when you are done, but there’s so much more value in being invested in what’s going on here. In life you’ll reflect back and not just to what you learned in a classroom setting but to those experiences that you had while you were at FIU. There’s a club for everybody. Make it fun! Meet the SGA president at Biscayne Bay Campus.